This Site is dedicated to the collection and preservation of a unique art form... New Trays added! 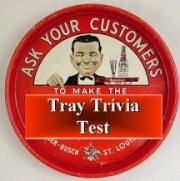 The Trayman's Last 60+ Trays are Here! The Trayman's Favorite Links are Here! 1. Yes, I know it has been forever since I have updated the site. Just not enough hours in the day with my job and life in general. I will be moving to Switzerland for a three year ExPat assignment with my company, so my guess is this pattern will continue! Thank God for eBay or I might have some serious withdrawals! 2. I will post some pictures of some of my recent, rarer trays I have gotten my mitts on - just in case you are interested. Now that eBay blinds the winner of their auctions, you can't easily figure out which trays are moving into which collections. 3. Once again I will miss the Blue Gray show this year, as I will be in Portugal or some other place where I will be way too busy with work to get to see anything other than my hotel room. Have fun everyone and have a slice or two of pizza for me! 4. Yes, I know my email address has changed. My provider had to rename their webservers and as a result, my email address had to change too. They said they would set up an "Alias" account and forward miss-adressed stuff to my new one, but guess what, they never did. I am working to fix all of the links I can find in the site, but there are over 1,000 pages, so there is a good bet I will miss a few. My new email address is ags81z240@trayman.net.